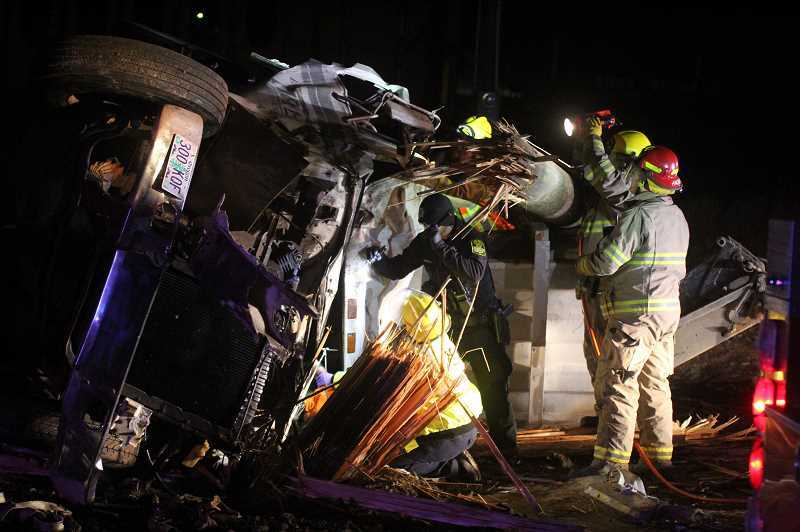 Emergency responders use hydraulic tool to extract truck driver, who was unable to call for help. A truck driver was trapped in an overturned semitruck off Highway 361, just south of Metolius, for more than four hours before he was discovered in the early morning hours of Jan. 23. John Clyde Straight, 30, of Redmond, told police that the accident occurred around 2 a.m., but he was unable to summon help because he was trapped in the vehicle. Oregon State Police, which investigated the crash, arrived at the scene around 6:40 a.m., last Wednesday, and reported, "The crash apparently occurred when the vehicle (a 1979 International Harvester) flatbed truck was northboud on Highway 361, approaching the city of Metolius." "For an unknown reason, the vehicle briefly drove onto the northbound shoulder of the highway before traveling back across the southbound (oncoming) lane and into an adjacent field," reported OSP senior trooper Charles Lindberg. "The vehicle slid into, and sheared off, a utility pole and flipped on its left side. The vehicle then slid into, and sheared off, a second utility pole before coming to rest." Because the highway is not lit in that area, the accident wasn't discovered until about 6:30 a.m., when an employee of a nearby business was arriving for work. First responders included the Jefferson County Fire Department, Jefferson County Sheriff's Office, and Jefferson County Emergency Medical Services. The fire department used a hydraulic rescue tool to free the driver, who was seriously injured in the crash. Straight was transported by air ambulance to St. Charles Bend.